It's always useful to have quick references for things. 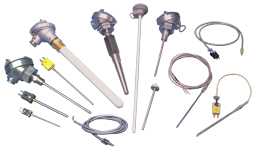 Durex, a globally recognized manufacturer of electric heating solutions, published the Temperature Sensor Element Selection Guide included below in a recent blog posting. It provides a consolidated comparison of the four primary temperature sensing devices used for industrial process control. Many will find it useful, so we share it with you here. All the technical expertise needed for your process heating challenges is readily accessible at BCE. Share your heating challenges with experts, combining your process and application knowledge with their expertise to develop effective solutions. Electric heating, though not the most energy efficient means of delivering heat, provides some distinct advantages as a means of controlling the temperature or thermal component of fluids and solids throughout commercial and industrial settings. Tubular elements are a common form of electric heater. Essentially a metal tube with resistance wire and electrical insulation inside, tubular elements can be configured into almost uncountable shapes and sizes. Manufacturers typically offer a range of standard sizes and ratings, but that should never deter you from making contact to discuss your ideas for a custom arrangement. Two mounting schemes that are readily used on tanks or other vessels are the screw plug and flanged heater assemblies. 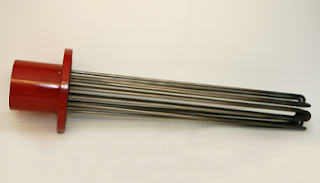 In each case, tubular heaters are bent in a "U" shape and fitted into either a pipe flange or a threaded plug. A junction box encloses the electrical terminations for the heating elements, providing a single ended assembly that can be easily mounted to an industrial standard mechanical connection. These assemblies are useful for tank or vessel OEMs that wish to provide a fluid heating option to their customers. Electric heat enables a properly configured controller to proportion heat into a subject fluid across a wide range, from very small packets that could be fractional percentages of full capacity to the fully available output of the heater. The units are compact, rugged, and can be configured to accommodate a broad array of industrial environments and applications. Selecting or specifying a unit is uncomplicated. 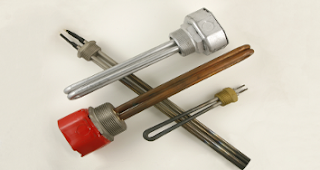 Determine the amount of heating capacity needed, then select the assembly mounting type (flange, screw plug, or other). Select an element sheath material that is compatible with the process media and a termination enclosure that suits the surrounding environment. Application assistance is available from product specialists who are well versed in the available options and can help you specify an assembly that provides excellent performance and an extended service life. You don't have to compromise anymore. EPOXY TO THE RESCUE. During the past decade, new epoxy compounds have been developed that rival glass and ceramic in performance. BCE is at the forefront of this development and leverages modern epoxy's unique properties to solve your feedthrough challenges. BCE custom epoxy vacuum feedthroughs offer the best choice in application flexibility, cost, and high performance. Epoxy feedthroughs are the right product for today’s fast moving markets. If you have to pass an electrical, pneumatic, or fiber-optic signal through a vacuum chamber wall, THINK OF BCE!